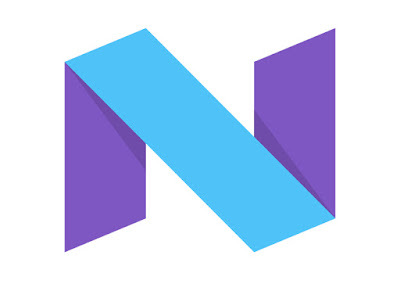 Whats new in Android Nougat 7.0 ? Most of the Mobile devices in Indian market by now received the update and its quite hard to recognize it unless to be a geeky to understand a certain changes in option and screen compare to previous versions of Operating system. 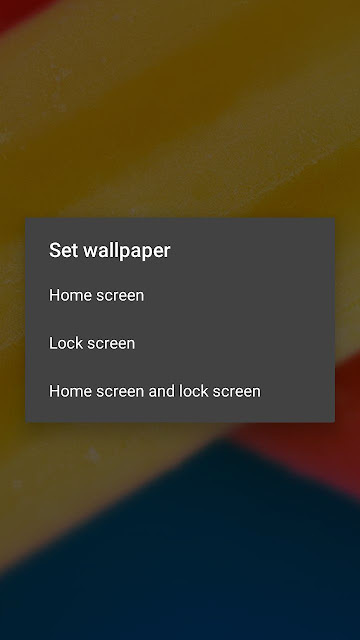 Craze of custom screen are not new and will not require a heavy update hence now-a-days no one is waiting for a new version to getting roll out just for a custom layout unless it has a power to upgrade the device in true mean. 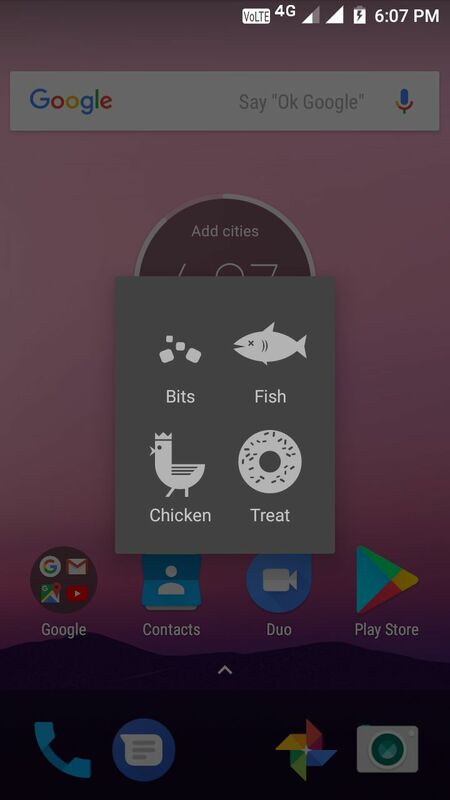 Foundation of Android Nougat is same based on Lollipop's footprint, people who are using a non custom purely Android design phones knows how the OS used to look like during Kitkat days then what they have witness later on. So far Android versions are known to be a upgrade of previous version with enhancement of an entire package, tats why its quite obvious to be curious about the new version all the time. 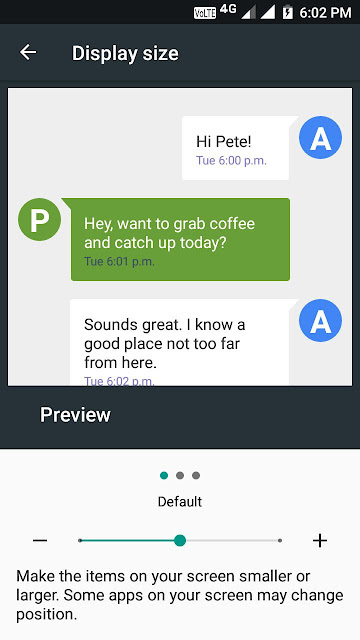 Lets explore the all new Android Nougat and its new feature. Whats new in Android Nougat ? Multitasking became a essential part of smart phone devices, we often do a switch and face a lag in our phone it is not a new story and not at all based on how hifi or costly the phone is its all about the flexibility of the platform and how program is design, Nougat now allows to switch back and forth between two most recent apps by double tapping the recent app button it works in split or in full app mode - a cool stuff by the new version. Split-Screen is again not new as various OEM versions has already introduced it, like Samsung included it in many high level versions. But now as a part of stock feature users will get to taste it in lower label phone as well. Split-Screen works both in Portrait and Landscape modes, where you have one app open and can continue working in another one simultaneously. 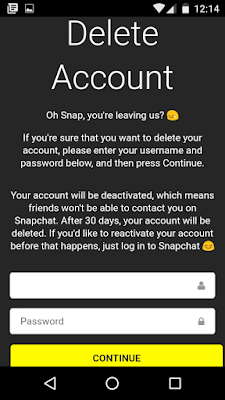 To enable it you needs to long press recent apps button to choose in between, it may lag sometime depends on the number of open apps but feature will not disappoint you. Thing to be noted here that Recent App button on whichever mobile is available through the screen will be transform to a hamburger icon. 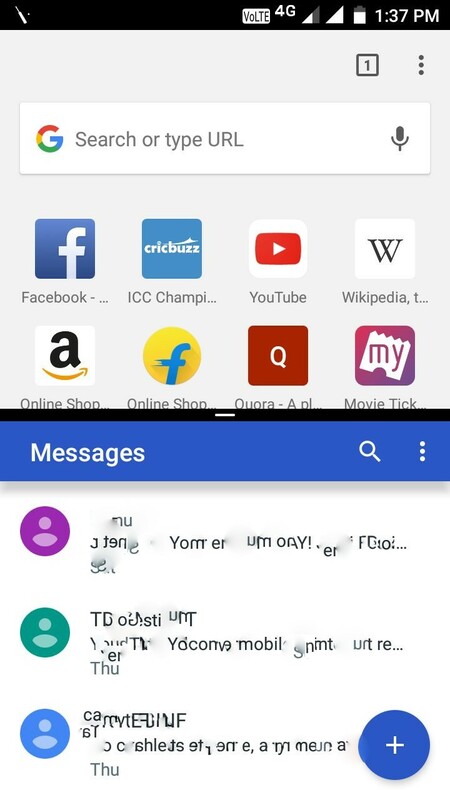 You have a limited ability to resize windows, to exit Split-Screen you needs to drag the barrier all the way to one side or simply long press the Recent App button. 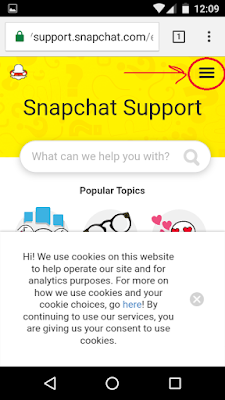 There might be a possibility that not all apps are supporting Split-Screen only way to go ahead is to check once by enabling the new feature. 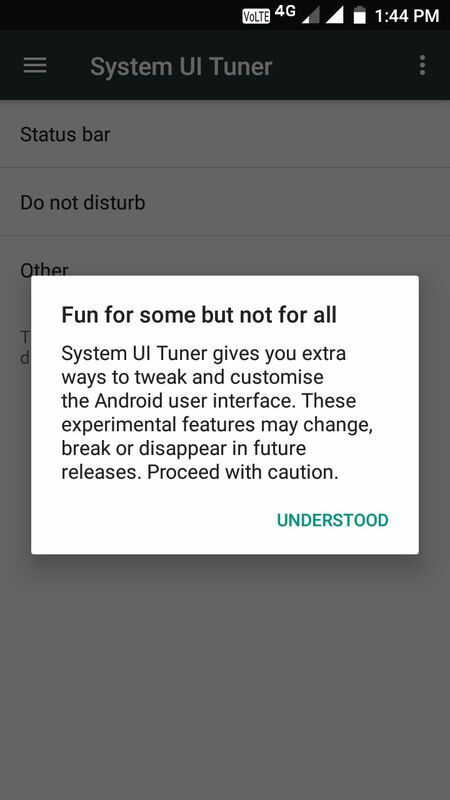 First of all reason for Android's success is to keep engaging its user based with some really cool stuffs, UI Tuner is a part of developer mode available on most of the OEMs which have the ability to tweak the Status Bar, Do Not Disturb and under Other, Add Swipe-Up, Split-Screen functionality. To enable the hidden "UI Tuner" menu you needs to pull down the notification shade and long-press the gear icon you may used to go to Settings, now under Settings menu System section you will find this feature mentioning "experimental features may change, break, or disappear in future releases. Proceed with caution." 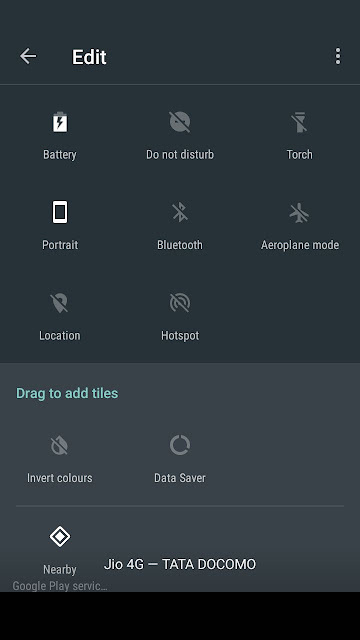 If you are still using earlier versions like Marshmallow or Lollipop then you still needs to compromise with the by default tiles whatever has been set or made available to you but with Nougat you can drag and drop the available tiles as per your requirement. 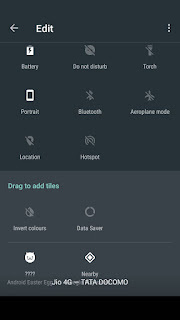 To access the full list you needs to pull down the top shade, expand the 3 dots on the right to choose between Wi-Fi, Bluetooth, Airplane Mode, etc. 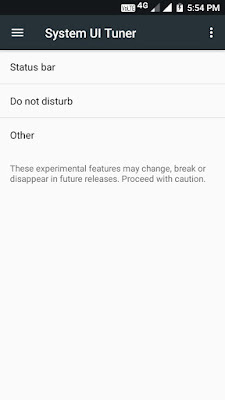 Nougat allow users to choose which tile will stay permanently and which needs to remain inactive from the list. You can add all the tiles or can rearrange them as per your requirement for ease of access. Tired from "N" number of App notifications ? Which keeps on alerting you even when its not required ! With Android Nougat you got more power. 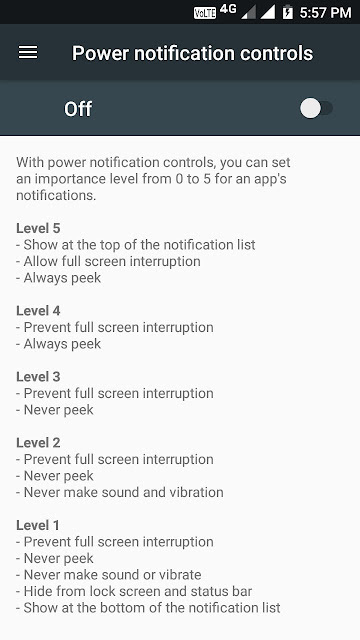 First you needs to enable the hidden UI and then needs to Toggle-on "Power notification controls" on which you gets a opportunity between Level 0 ( Block all notifications ) to Level 5 ( Show at the top of the notification list, allow full-screen disruption ). 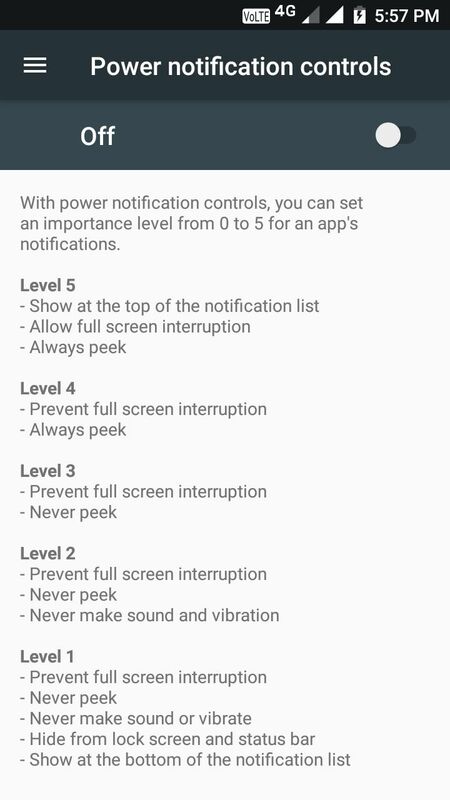 Now you'll able to set up each and every of your app's notification level by going to Settings > Notifications, tap to the large green "A" to the slide's left. App-notification preferences can be easily accessible after long pressing to the particular notification in the pull down shade to reveal the little gear icon, this trick obviously works in lock screen like tiles of shade. This is a most common and already available feature in most of the OEMs, finally makes its stock debut via Nougat. It is as simple as we used to access normally in Android to setup a Wallpaper by long pressing on Home screen, you'll get a option between two whether you want wallpaper for your home screen, lock screen, or both once you select which pic you want. 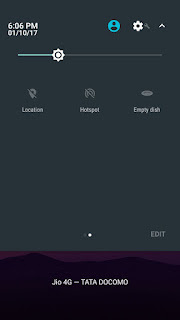 Small little changes made by Google with Nougat starts with Daydream become Screen Saver due its VR Platform, they also added Clear All button to close all recent opened apps till now this feature was available from different OEMs only. Now Nougat is more accountable towards APKs by giving a specific tab with full infos as trend to install apps from APKs has increased hence Google start working on APKs as well by collecting specific data. 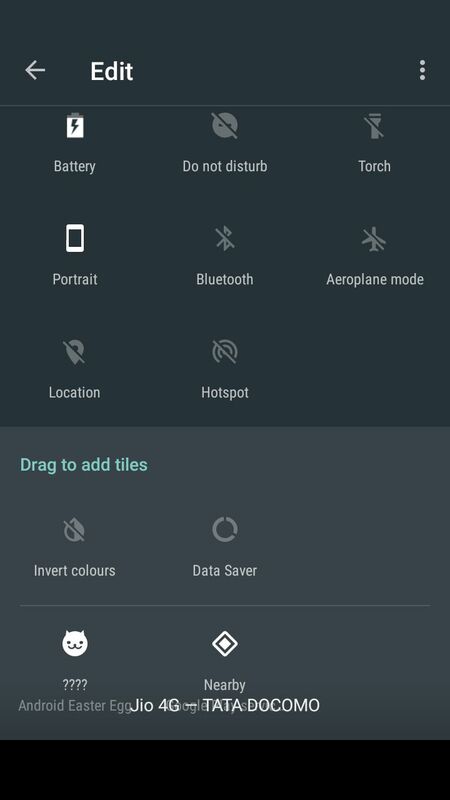 With Nougat, Google also tried helping users with Data usage part by adding Data Saver option which is more specific and clear then before as "Restrict Background Data". Google also added recommendation based on various features and settings you should setup. 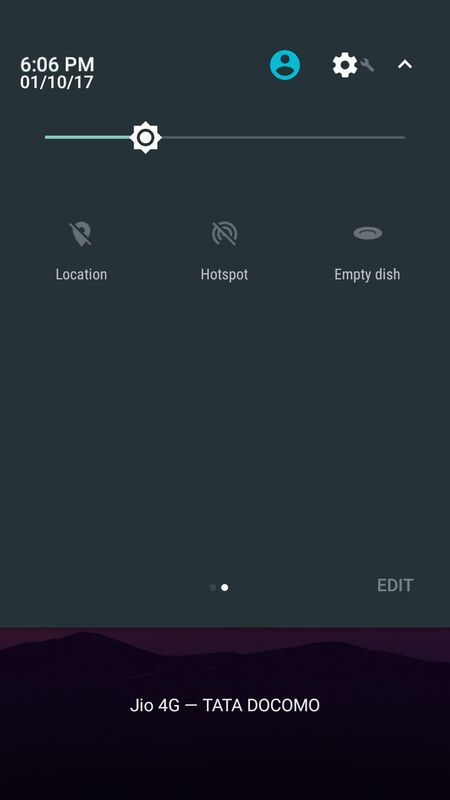 Along with new Emoji's, Nougat also added Cancel button for app downloads which was earlier available through OEMs only. Among various changes Display Size is one of those which is more enlighten this time then before. In earlier version it used to known as Font Size to increase or decrease font size although it do resize the icons as well but was never mentioned, this time with Display Size, Nougat provided the transparency to showcase the impact if user touches the setting. Finally, lets talk about the hidden game which Google used to offer with their OS every time, this time too they didn't disappointed by adding a complicated one ! 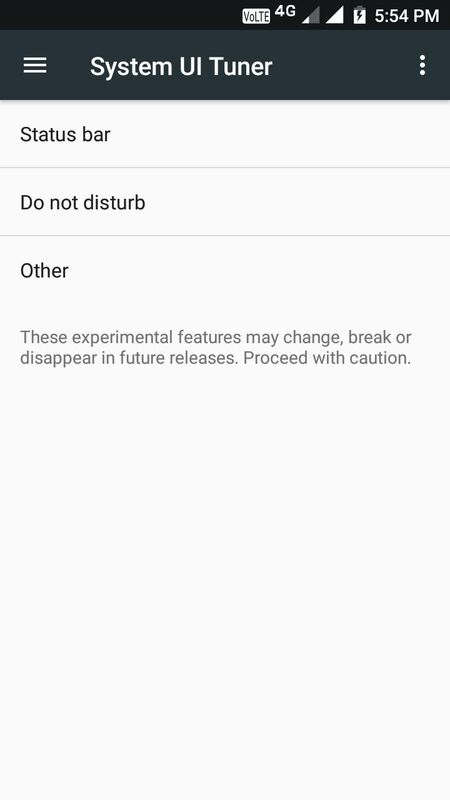 * To start with go to Settings > About > Phone repeatedly tap the version to prompt a Nougat logo. 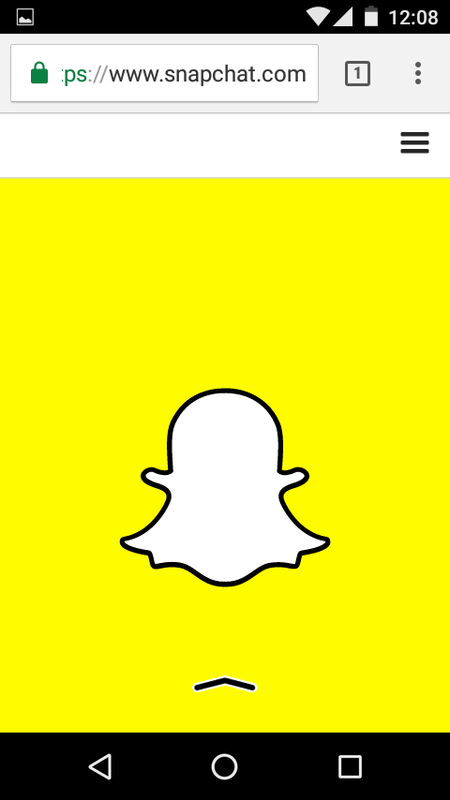 * Long tap the logo until a little cat emoji appears in the bottom of the screen. * Pull down the notification shade. * Hit edit you will find the little cat icon with labelled ???? Drag and Drop wherever you like in the notification shade. * Now again when you pull down the shade you'll see a tile for "empty plate". 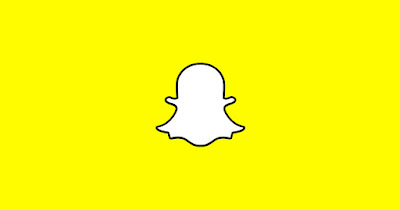 Tap that to prompt a choice and have fun. How to remove Custom URL from Blogspot Site ? Active users of blogspot must have this question on their mind and its quite important for a reason due to its importance as adding or removing custom domain directly impact the blogspot page. Custom URL not only simplifies the identity of the blog page but also attracts the reader with few tweaks and tricks. Custom URLs do boost traffic and contributes to add more numbers due to its simplification in identity, tats why for small startups who can't afford to invest money on servers or websites they can easily have one blog account with custom URL in to have a dream website. Now this space is about removing Custom URL from Blogspot Site, have already discussed changing Blogspot URL with Custom URL. There are two thing which is quite important in migration part and its - 1st, It will directly impact the traffic on the page if taking this point w.r.t current topic then it will hit the page more negatively as the reader of the page may be accessing it with old address hence its importantly necessary to guide readers to start accessing the page with by default address w.e.f one fixed date. 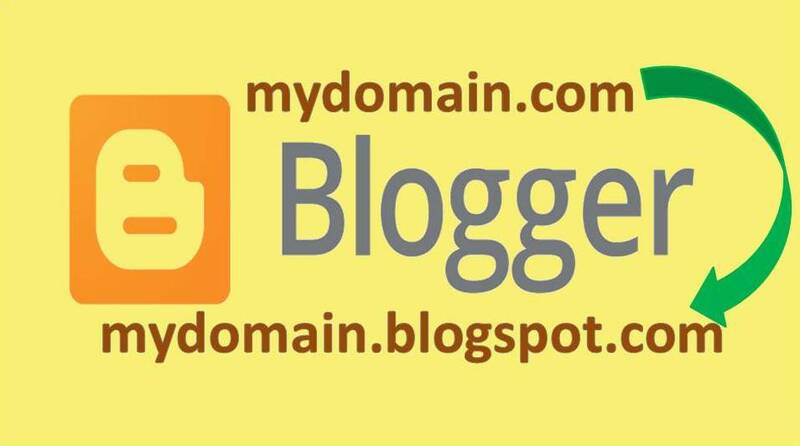 2nd, Currently Blogspot is not providing secure connection to any Custom Domain pages, they may with domains purchased from Google but not from any Third - Party Registrar. Social media junkie who wants to try on having something like "Official Page" can try a combination of Blogspot page + Custom Domain with one key area to look is that whether they got a potential to cover the financial part to hold custom domain or not which comes with certain investment on buying or even in renewing from different - different registrar. Its quite easy to remove Custom URL from the site as Blogspot provides the flexibility keep in mind that changing to custom url or to default url will directly impact the page view and not at all preferable if having active ads on it. 1. In landing page of Blogger you will see Settings, by clicking into it you will get Basic with lots of categories in the screen. 2. Under Publishing, Blog Address related stuff will let you change the URL. 3. Click on the cross along side your Custom URL. 4. A confirmation URL will pop up before to go ahead. 5. And its all set to your by Default Blogspot URL. This is how you can revert it back, hope this space resolves some queries! Whats new in Windows 10 Creators Update ? Microsoft haven't stopped yet after their Windows 10 Free Update Push, they kept their user base excited with all new feature which either are demanded or shared by their users with different modes of Feedback Session. Windows constantly working to make sure that their Windows 10 remains best of the best which they tries to prove with their Anniversary Edition and now with Creators Update. To find how to get a Creators Update click here. Microsoft also utilized their acquisitions well to bring new updates along with changes in the features and making sure that people never think to go back rather then keeping them updated with latest of Windows 10. Whats new in the Bag ? Its called to be the biggest update for Gamers and claimed to provide the best experience in performance via Microsoft's Windows Store and old Win32 Application Platform. To get set go for the gaming mode, user can use Windows Button + G which will provide the specific options of Record, Capture, Broadcast with Settings and under Settings you will get to see General for Game Mode and Game DVR, Broadcast and Audio related options. The basic theory behind the Game Mode to improve the performance of your PC while playing the games and let the maximum resources in for the on going game and cut it down from the others. With Broadcasting feature, its now more easy to demonstrate your gaming ability Live, it can be used to create a tutorials for Windows 10 as well. Though unfortunately as of now you can only stream to your XBox Live Community and not in the popular alternatives like Youtube. This Service is powered by Beam which Microsoft bought in August last year. To enhance improvements, Microsoft partnered with Dolby to bring Dolby Atoms positional sound to PC and XBox One, for this you don't needs for any extra bit of Hardware and with any pair of Headphones you will feel the Dolby Atoms positional sound, thanks to Windows 10. Windows 10 knows for the two big controversy, one is Privacy and another one is no control in updates. Since Microsoft's concentration from the update is over they now have a task of Customer-centric Privacy. The new Privacy as per Microsoft is simpler with there is no room for "Intermediate" like it used to be before, they continue with Full Access or No Access with a beautiful description of what users will miss if opt for No Access and how its beneficial for the Users if kept it on !! Users have the same toggling to enable or disable Privacy but introduced with a description part called Privacy Dashboard. With every update Microsoft ask to look at the Privacy, Learn More and Accept. 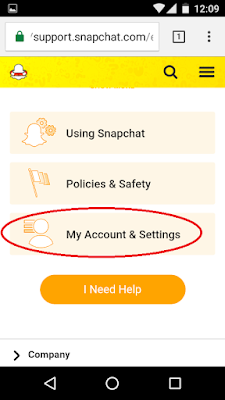 You can though update the same later as well under Settings > Privacy. Revamped policy strip away the option called "Enhanced" from a Feedback and Diagnostics now Microsoft only dealing with Basic and Full with Basic they will take only necessary data which will helps to keep the system upto date and secure and with Full its about the entire set of data which is also a by default selected option to serve you better !! Well its not for Home edition first of all, but for Professionals, Enterprises and Education Editions users, now you have a option to pause the update upto 35 days by going to Settings > Update & Security > Windows Update > Advance Options > Pause Updates. But its not that there is no relief for Home Edition users, now with recent changes users have a option to choose "Pick a time" or snooze it upto next 3 days, its a relief for those who do not wants to disturb or wait till the update took its own time to update the system. Windows made a slight update in Active Hours by increasing from 12 hours to 18 hours, you can set the time according to your convenience for the recent update installation. Now vanishing "Metered" from Windows 10 is little bit disappointing which used to barred further updates in the OS. Although you can enable it but it will hold partial updates and not full. According to Microsoft they will not push any heavy updates but only those which is required them to keep the OS running smoothly. Although you can update the settings of Ethernet to Metered by going to Settings > Network & Internet > Ethernet, so that with Wired connection you can save data by keeping the essential update on. With Unified Update Platform though Windows promised to provide to make the future update little bit smaller then previous one like Anniversary Update or now with Creators Update, though have mentioned about the approx size of the update so that Metered connection users should always be ready for it. Creators Update is bit different with a inclusion of 3D Paint it came after the acquisition of Minecraft. Users can find it under Paint and when you click on it a separate window will be open for the same. Any professional and non professional can have a hand on 3D with new build on feature. You can now create a 3D model and can Preview it in 3D as well by rotating around or by zoom in before to used it in any small or big work. It supports with a extension of .fbx and .3mf file type. With this new changes Windows 10 also supporting 3D contents in Edge Browser to upload and download 3D models including exported from Minecraft and Sketchup via community website called Remix3D. Windows 10 also have a potential to print 3D via 3D Printer and with this Microsoft will now have the aim to implement 3D thing on their Office Software by rolling out Updates or launching a new version. This feature is quite unique and will be cover the most of the Users of Windows 10 as with Dynamic Locking system any User who paired their Mobile Device with the Laptop via Bluetooth if left the system with their phones then it will automatically gets Locked within 30 seconds and then there will be no manual effort of Windows + L gonna required. Officially this facility is available with Smartphones but may be Bluetooth Enabled device can also work. 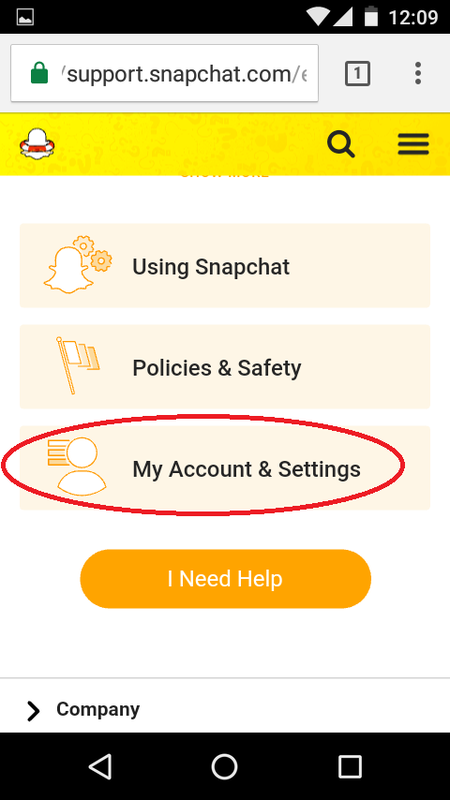 For the setup you needs go under Settings > Accounts > Sign-In Options. With every update Microsoft's push is to expand and upgrade Cortana from Better to Best. Its their ambitious project and they're working with every possible improvements to remain competitive in the Market and now with Creators Update you can voice command Cortana for Turning off the PC, Restart, Locking the System or Put into Sleep. It will also hear you for Raising or Reducing the Voice. Along with Cortana you will now getting Full Screen Mode after enabling "Hello Cortana", its also now flexible to set a Monthly or Yearly Reminder of special dates like Anniversary or Birthdays. Only update for Edge so far in this Creators Update, now user can see a preview of other Tab by clicking on a icon of down arrow which will also mention as Show Tab Previews. Edge will also block Flash plugins by default and going to support HTML 5 contents. Though you can choose whether to continue with Flash or not. Avoiding will enhance the performance, save the battery life and gonna increase the security. Windows now offering E Books on their Windows Store "Books" Section though Windows 10 does not contain any E Book Reader App so far but yes Edge Browser do with a format like ePUB. When you tap Menu Button in Edge Browser you will found eBook Library along with Download, Favorite and History. Night Light is the previous Blue Light, its a follow of a theory which turn screen into a Warm Temperature so that you gets a sleep right way after using your system at Night. You can allow Windows to automatically enable Night Light mode at Sunset and disable it at Sunrise. For a Manual configuration visit Settings > System > Display Night Light Settings. 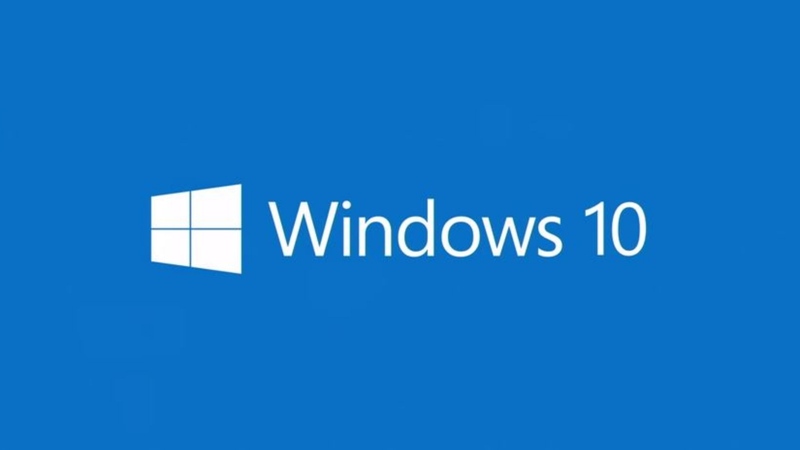 Enabling it will let Windows 10 automatically free up disk space, though feature is off by default. To enable it visit Settings > System > Storage and then Windows will automatically erase all the temporary files and recycle bin to free up the space. The old desktop application is now replaced with "Universal Windows Platform" with new Creators Update. Its now one stop destination from threat protection, gives you the better analysis of Device's Health and its Performance, Firewall, App and Browser Control which helps you to clean Manufacturer-installed bloatware. Also with this you can personalize the usage of the system for your Family Members and can buy suitable apps like Games and Learning Apps from Windows Store. We can expect more updates and options with Windows 10, these features are the main highlight of Windows 10 Creators Update so far. How to change the Time Zone of Blogger ? How to update Windows 10 Creators Update ? Microsoft soon to be release the Windows 10 Creators Updates for all it will be mandatory download hence Microsoft rather playing safe by allowing a pilot download to those who wants it before and can share a feedback as well before it reaching to everyone. Question is whats special in this update and what Microsoft wants to add with this update ? But as of now if any user wish to download the Windows 10 creators update then they can. There is no special prerequisite required and its very easy to follows it. Limited Data users needs to have a backup of High Speed Internet Data of 5Gb or above. Windows may start downloading other crucial updates which you have skipped or either yet to received. * To check whether Microsoft letting you to download the Windows 10 Creators Update, Click on Start > Settings > Updates and Security. * Once you agree to download it, you needs to click on "Yes, show me how", it will landed you on Windows 10 Creators Update page. You can read the entire stuff of Microsoft before clicking on "Update Assistant". It will download a 6.75 MB program. * Once running the program a page will open, you can read the entire stuff and whether its feasible for you to go for the update or not. # Remember that to play a safer side backup of atleast 4 to 5Gb approx high speed data is required for the software. * System will then analysis the compatibility. * Post downloading a timer will begun regarding the restarting of the system, you can reschedules it with "Restart Later" option or can go with immediate Restart before saving all the ongoing work. Update will take approx 90 minutes or so to finish the job and initially you may face hang in the system or lag to open stuffs of your PC. Your files will remain wherever you left them hence there is no data loss with this process. This is how you can update Windows 10 Creators Update. 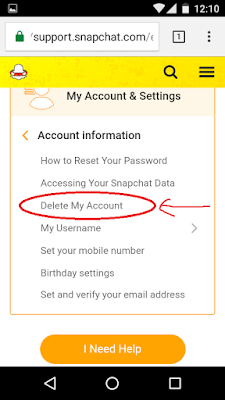 Last time on a topic related to Snapchat had discussed about creating Snapchat account, in this topic will cover about the way account can be deleted. 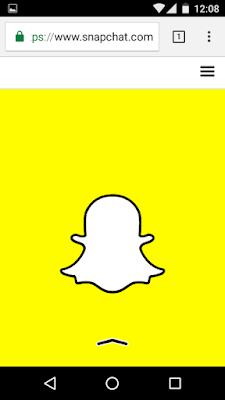 As mentioned last time that Snapchat is quite a tricky app and those who tried it in India must knows about it. 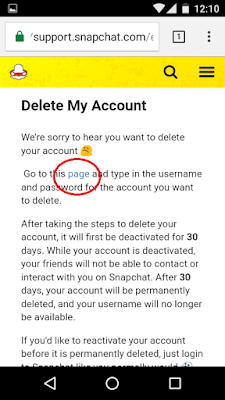 Snapchat is nothing to offer via Website though its something similar to Instagram, with Insta users can check the timeline of their "Following" but not the case with Snapchat, yes like Insta where user can deactivate the account temporary Snapchat too provide the option of deleting the account via Website only. 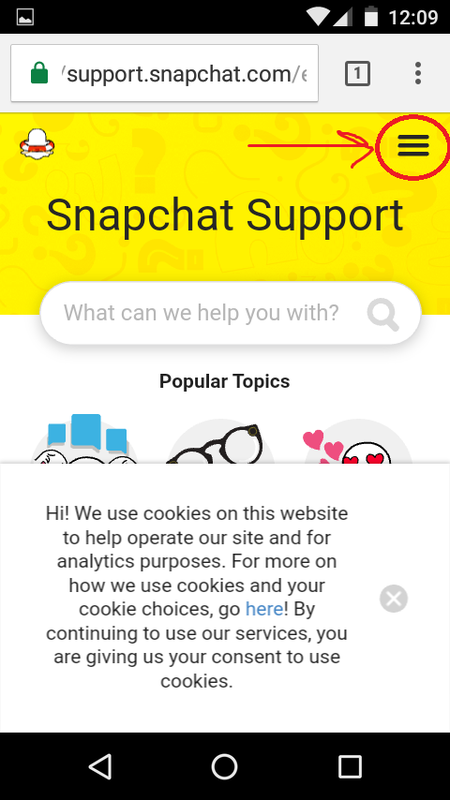 * First of all user needs to browser the official website of Snapchat, make sure to add https if typing manually. 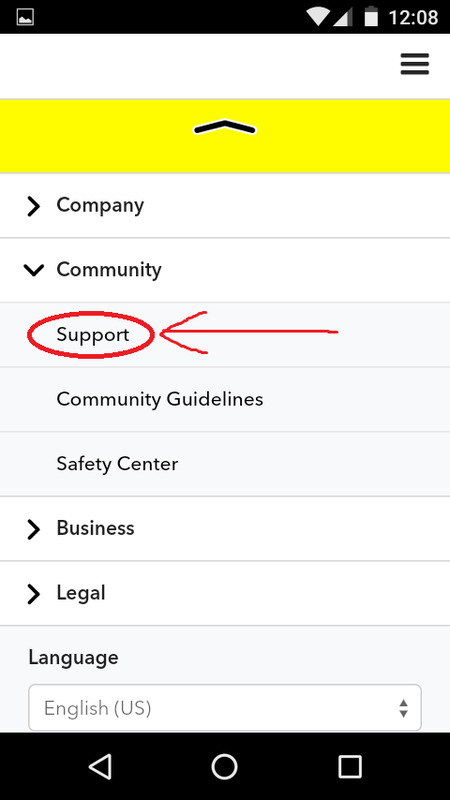 * Scroll down you will get Support option through a tray design in a Website, you needs to click on it or you can directly reach into it by typing Support URL, again make sure to add https. 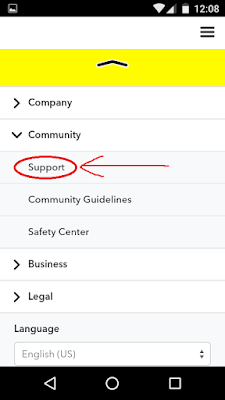 * After the Support Page you will see 3 Lines at right hand top, click into it. 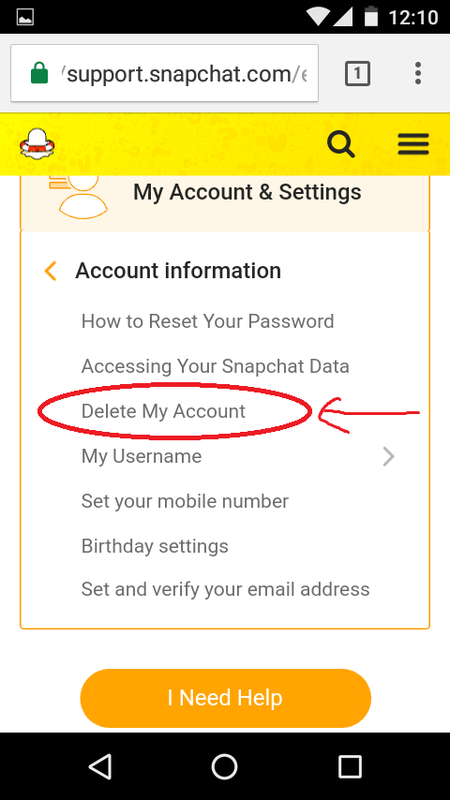 * Then click on "My Account & Settings"
* At Account Information, you will get "Delete My Account" option (you might encounter few more options under Account Information as per updates in the Website). 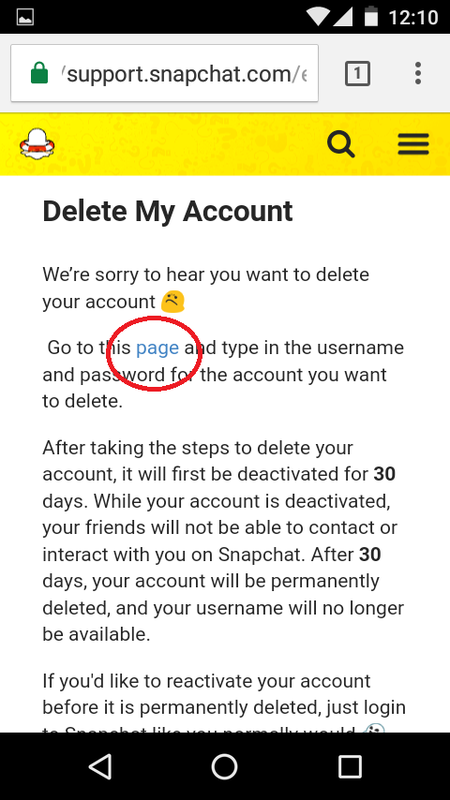 * Now next page will contain a emotional message of Snapchat, their entire post can be updated as per company's policy and link's position. * In next page you needs to provide your Username and Password and needs to click continue. 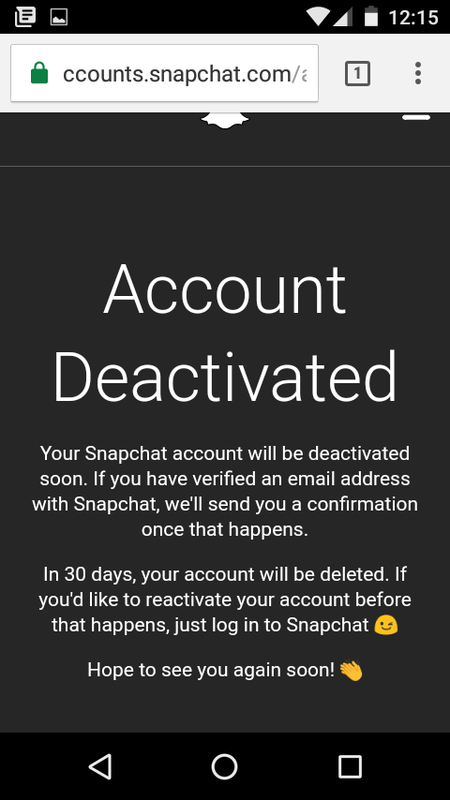 * Once done they will confirm you regarding your Account Deactivation, you will get 30 days to restore your account otherwise after 30 days its not possible to reactivate it again. You will get a confirmation email as well if your account is linked with Verified Email ID. 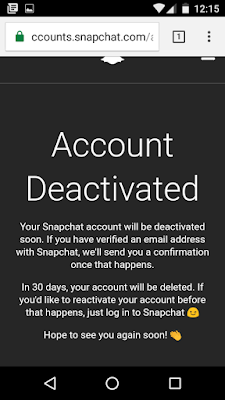 Disclaimer: This post is not intent to discourage Snapchat users and should be read as informative purpose only, post motive is not to offend but only for awareness. 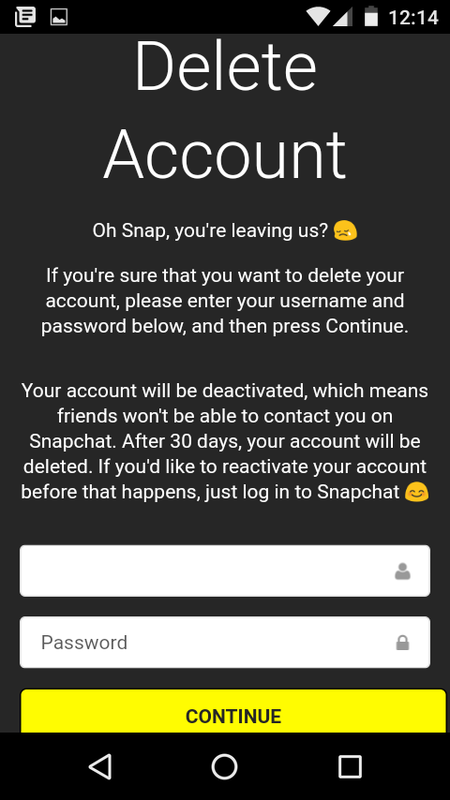 Writer and Website will not hold any responsibility regarding users business with Snapchat. 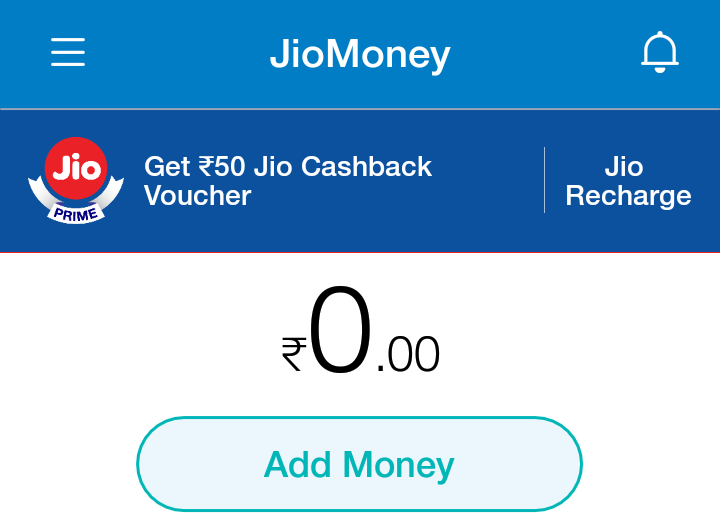 How to signup for Jio Money and recharge for Jio Prime ? Well Reliance Jio came up with another surprise and they extended the date for Prime Subscription for another 15 days till April 15th, Now Jio Users can subscribe for Jio Prime and Jio Packs in this period of time and Prime Users whoever recharges the number for Rs. 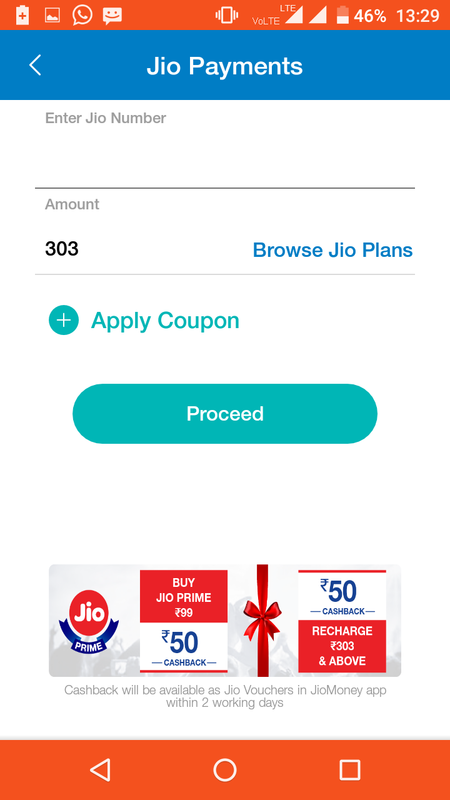 303 or above will going to get Jio Pack for another 3 months as complimentary basis from the Company end, which is again going to be a free fair deal for a Customer. 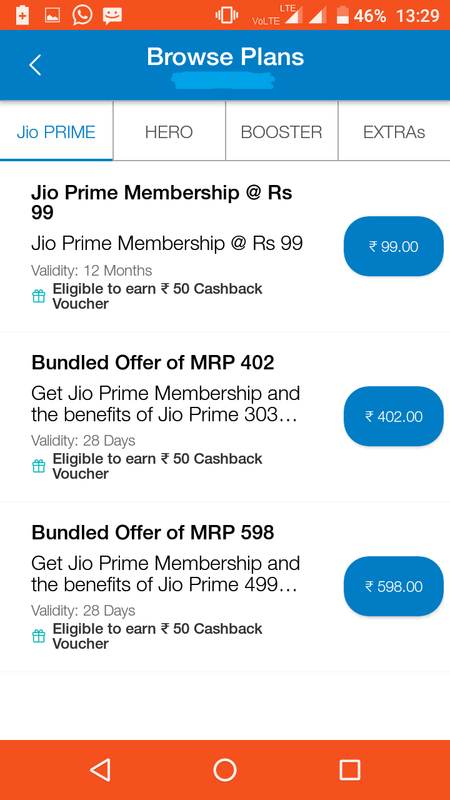 Now those who still has no idea how to Subscribe for Prime or Prime Packs can read here also: How to signup for Jio Prime Membership ? And people who wants to enjoy Jio and wants to earn some extra cashback kind of thing then this space is going to be very important for them. For Jio subscription if users signup for Jio Money and recharge from it, then with every recharge users will have the opportunity to earn Rs. 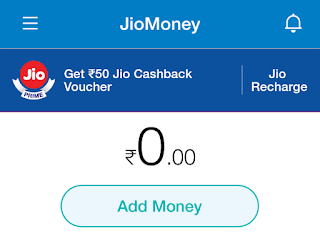 50 back as a Coupon cashback, now till 31st March the limit was 5 times means every user of Jio Money can earn Rs. 50 as a coupon till the 5th Recharge, now since company has launched "Jio Summer Surprise Offer" which will be valid till July 2017 it will be interesting to know whether Company will going to update any Terms and Conditions of Jio Money Coupons or will it be remain same ? But if you got multiple Jio recharges to do then Jio Money is your destination. * The cashback is a Coupons unless like regular Wallets like Paytm, Mobikwik which gives a cashback in a wallet which can be redeem by buying any other stuffs or recharging to other Networks or DTH etc. or withdrawal to the Bank but Jio coupons are different and as of now it can be used on Jio recharges only. * For ex. if a user subscribes for Jio Prime Membership worth Rs. 99, Customer will get Jio Coupon worth of Rs. 50 within 2 Working Days, Now user can apply the Coupon for next recharge which is in the case of Rs. 303 or higher, the recharge amount will be of Rs. 50 or less for a payment and then user will get a opportunity to earn another Rs. 50 as a Coupon from Jio for another Recharge. ** These coupons will be valid for next 3 Months only, but Reliance Industries has all rights to withdrawal from this cashback scheme or can update Terms and Conditions any time. 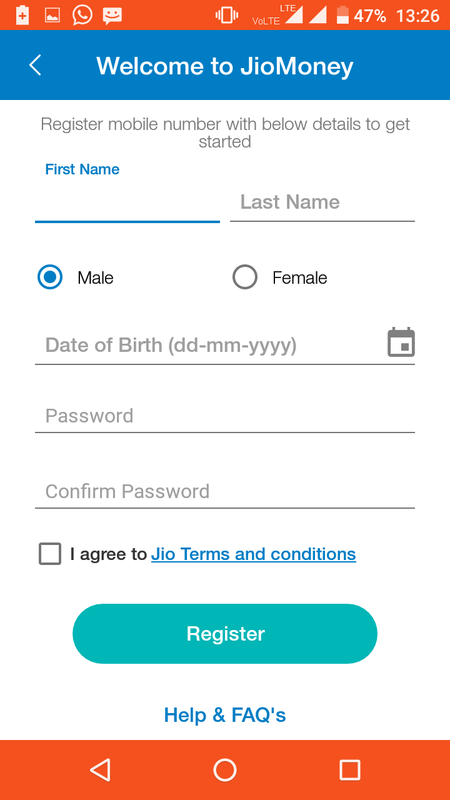 How to Signup for Jio Money and Recharge for Reliance Jio ? # First of all you have to download Jio Money App from Playstore or iTunes depends on respective phone. 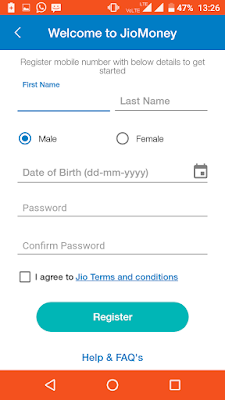 # Once launched it will ask to put your desired "Mobile Number" from which you wants to create your Jio Money Account, its not mandatory to use Jio Number you can add any of your other numbers too. Then Click for Login/Signup. 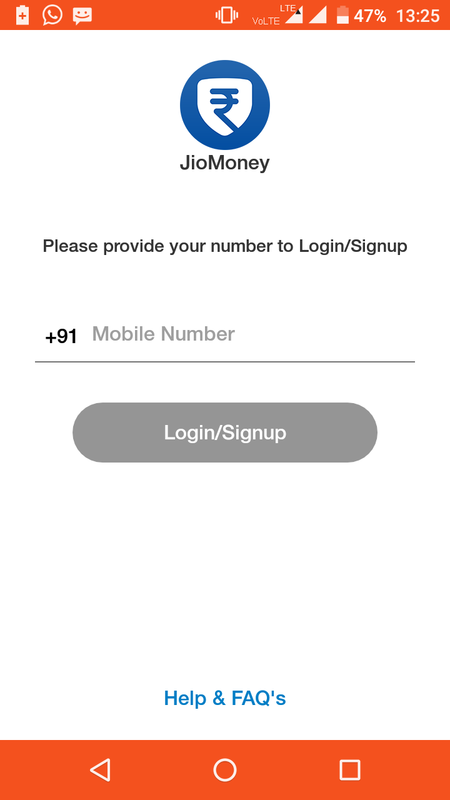 # Now it will move you to a registration page where you needs to fill information required. Password should be complex like Capital Letter, Small Letter, Special Character and Numerical. 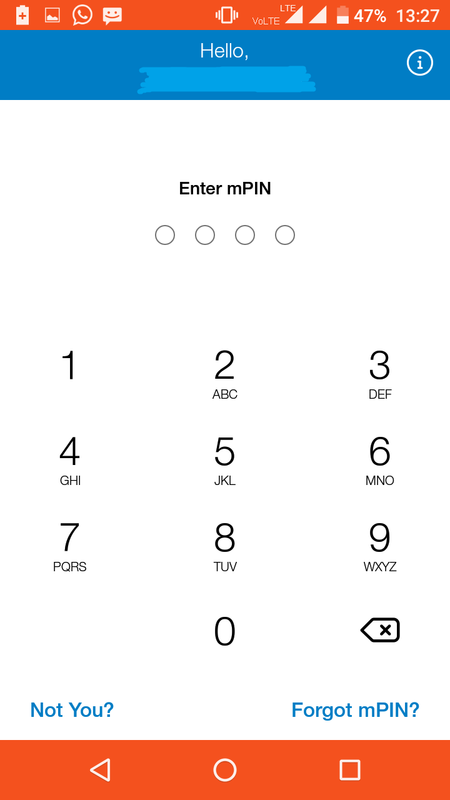 # After the step you will be ask to verify the number once verified you will be ask to set a 4 Digit mPIN. 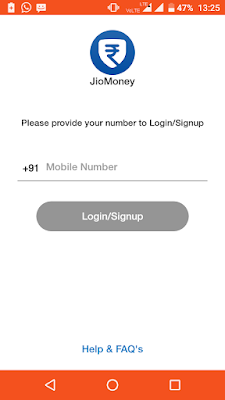 # Once all done you will be ask to login into your account, once giving the Mobile Number along with a Password you will ask to provide the 4 Digit mPIN you set during the registration. # Now you have 2 options before to recharge, either add money in Jio Money Wallet or do a Direct Recharge ! 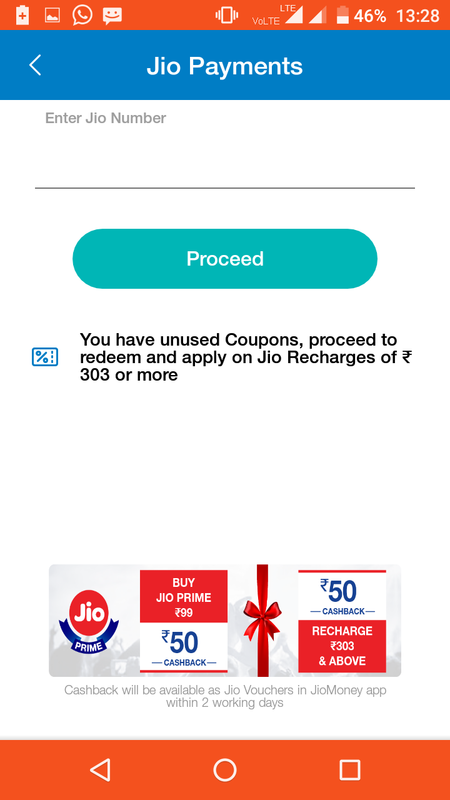 For direct recharge, click on top strip where its mentioning about the offer along with Jio Recharge. # Now in next page you needs to add a Jio Number which you wants to recharge and Click on Proceed, if you have any unclaimed Jio Coupon on your account then a notification will be shown otherwise it will remain blank. # Now in next page you will have following recharge options along with notification of Rs. 50 cashback, if you're already a Prime Member then you can checkout other Tabs for your best suitable recharge. # After clicking to desire Recharge, you will be ask to apply Coupon if you have any otherwise simply Proceed. # Then you will be moved to select a desire payment method and then you will be redirected to a payment Gateway where you can proceed for a Payment. 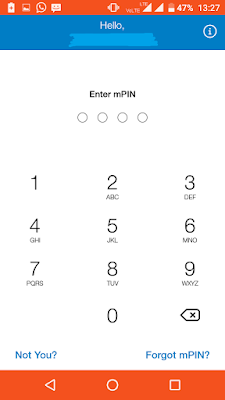 With certain Debit Cards or Credit Cards if system throws error then it means that particular card is not accepted by the Company, you can contact Reliance Jio for more. 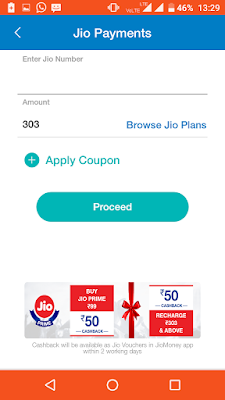 - After recharge is successfully done within few hours you will be credited with a Jio Coupon though it can be longer then tat as the promised timeline is 2 Working Days. 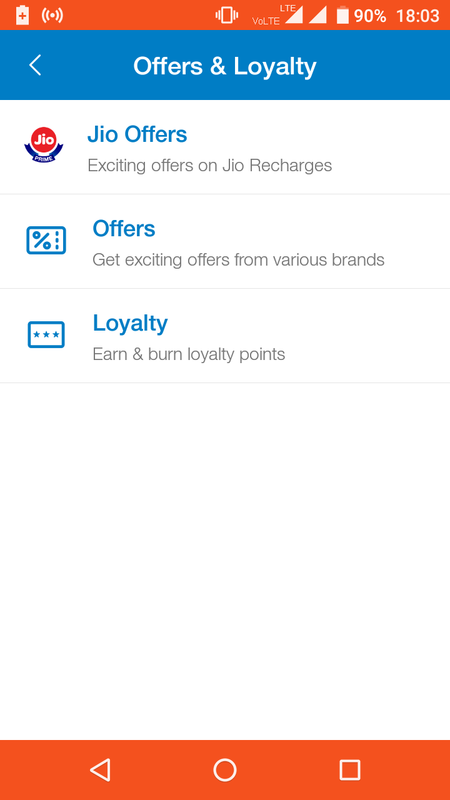 - To watch the Coupons you needs to click on "Offers and Loyalty" at the bottom of Main Page of Jio Money. 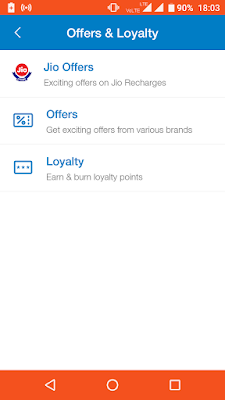 At the Offers and Loyalty page, you needs to click on Jio Offers. - After clicking on the page you will able to see the number of coupons you have earned with every recharge. - You can check out the Terms and Condition and Validity of the Coupons by clicking into it. This is how you can be beneficial if Jio is your ultimate home !! For more information contact Jio Care. ** Disclaimer: The following post is not intent to promote Reliance Jio or Jio Money nor the author received any goodwill from the Company to write this, this post is just for awareness purpose only and Author +Anirudha Das or +TechEngineerTV.com will not hold any responsibility between any Individual's business with Reliance Industries.